On the same night that Wales beat Belgium in a European qualifier, construction industry professionals in Wales gathered at the Celtic Manor to confirm what they already knew – that Wales is a world leader in the built environment. We can boast some of the best projects, innovative design methods, superb technical engineering skills and outstanding project management and leadership and what’s more, we can also be proud of a pipeline of young talent. All of these qualities and more were evident as Jason Mohammad guided the audience through the gamut of great projects and organisations to reward the winners. It was a great night and only right to make sure you know who the winners are and why they were chosen by the judges. What makes a good client? Clear, consistent leadership and commitment to core Constructing Excellence principles. Over the past few years City and County of Swansea has worked hard to transform its traditional, adversarial procurement culture into a more open, collaborative approach based on value. Its success in winning this year’s Client of the Year award is based on the leadership it has shown in procuring new schools as part of the 21st Century Schools programme. One project in particular, the new comprehensive school in Morriston, demonstrates the council’s commitment to positive practices such as early contractor involvement, stakeholder engagement and integrated team working. Swansea understood from the start that it was ‘not just about buildings’; it was about educational achievement, raising standards, and creating a beacon facility for the surrounding community. The council’s representative on the project team ensured that the end users were fully integrated into the design and construction process, and stakeholders were involved in every project activity. All design elements were linked to actual school-based targets for educational outcomes in each of the curriculum areas. Close working relationships ensured that the tightly integrated project team bought into the council’s vision and goals. Swansea also demonstrated its willingness to innovate, as in its piloting of project bank accounts (PBAs). The result speaks for itself: Morriston was shortlisted for the Project of the Year and Integration awards. But it’s not just about one outstanding project; the council has pursued early contractor involvement for many years. It understands the importance of building long-term relationships without excluding new contractors. And it’s not about to rest on its laurels. ‘It’s critical that we promote innovation and success and continue to learn as organisations and individuals if we are to continue to develop a collaborative culture,’ the council declares. ‘Hopefully, our open and transparent approach makes us a client the contractors want to work for’. The Welsh construction industry needs people willing to put their heads above the parapet and take a leading role in driving progress and best practice. Thomas CMS (Holdings), a £5.3 million turnover contractor with 42 employees based in Mid Glamorgan, was nominated by Melin Homes for its readiness to act as a trailblazer, voicing concerns and offering solutions to problems faced by SMEs in the sector. It is involved in researching issues such as pre-qualification questionnaires, sharing best practice, and supporting individuals and companies to gain qualifications and accreditations relating to sustainability. It has also acted as a broker pulling together a number of local businesses on the Arbed energy performance framework, enabling them to collaborate and bid successfully for contracts that would normally have been won by larger contractors outside Wales. This has led to a positive impact on local communities in gaining value for the Welsh pound – measured by Melin Homes using the Welsh Government’s community benefits measurement tool. The strength of the Welsh construction industry rests on the skills of its people, and Pro Steel Engineering has shown itself readier than most to invest in staff development. The company, based in Monmouthshire with a turnover of £3.6 million, provides professional construction and project management services. It has invested over £50,000 in programmes to motivate staff, boost skills and deliver a positive customer experience. The company encourages open discussion within the wider team to help improve working practices, and has developed a career development programme for subcontractors. All these efforts paid off in 2014 when the company created more than 100 new jobs through a contract to strengthen the steelwork at the Queen Elizabeth Olympic Park in London. Pro Steel’s commitment to the highest standards of work, skills and on-site health and safety has led to the award of several high-profile contracts across the UK. The company has expanded rapidly and last year relocated to larger premises with a dedicated steel fabrication warehouse. Early contractor involvement and collaborative working on this challenging civil engineering project were essential in devising a practical and ingenious solution to an environmental problem. The project involved refurbishing a bridge over the environmentally sensitive River Wye while keeping the bridge open for people cycling or on foot. The client, Powys County Council, and Natural Resources Wales (NRW) had planned the use of hydrodemolition to remove the bridge’s existing concrete, but Dawnus, the main contractor, believed this presented a serious environmental risk. Hydrodemolition produces large quantities of wastewater containing sediment that Dawnus felt would be highly polluting to the river. During the early design phase, Dawnus led the project team in a brainstorming process that came up with a unique solution – diamond wire-cutting the crossheads and columns into one cubic metre blocks, then removing them for disposal. While wire cutting is nothing new, the process by which the blocks were transported – sliding them on a temporary works platform to the edge of the bridge deck, then winching them up – is inventive. This method reduced the risk of pollution and significantly shortened the time spent working above the river. Specially adapted temporary structures were developed to support the bridge during the demolition process and provide the necessary high-level access. Overall, the judges considered this to be a genuinely innovative approach to tackling an environmentally sensitive problem. It was clear that the collaborative approach by the whole supply chain contributed to the solution, bringing together the expertise and experience of designers, consultants and subcontractors. The project was handed over to the client 18 weeks early with no defects, lost time or environmental incidents. The judges noted that the solution can be replicated on other projects requiring the removal and disposal of concrete. This new building is part of Rhondda Cynon Taf Council’s £50 million education, leisure and community redevelopment in Aberdare. The judges thought it was a convincing demonstration of the benefits of off-site manufacture and other modern methods of construction, with definite lessons to be learned by the wider industry. This impressive project has also won the Project of the Year Award, not least because of the commitment shown by the entire delivery team in constructing the new state-of-the-art community educational facility. The complex task of rationalising three special education needs (SEN) schools and a secondary school into a single site was achieved on time and within budget largely because of the collaborative ethos and willingness to share information. All work packages were collectively reviewed, ensuring tight control of costs, and all stakeholders bought into the sequential sign-off procedures, ensuring that the 800 individual areas were snag-free on handover. The judges were equally taken with the enthusiastic efforts to engage the schools and the wider community. Over 9,300 interactions with pupils took place, and more than 450 hours were donated to school projects. Construction ambassadors were appointed from each of the original four schools to ensure all pupils were engaged. The headmaster of the new SEN school confirmed that the educational stakeholders had been treated as equal partners. The targeted recruitment and training strategy was particularly ambitious, aiming for 80 new-entrant person weeks per £1 million spent. Thanks to the team’s success in building strong relationships with other agencies, this goal was exceeded by 25 per cent. The project delivered genuine opportunities for 184 previously unemployed people and 83 apprentices and trainees, along with work experience for pupils from the schools involved. As much as 83 per cent of the £39 million project budget was spent in Wales, and 1,422 people were employed from within a 25-mile radius. In the true spirit of collaborative working, the contractor has shared its learning with the wider industry with the aim of improving a new school building within the sector. This new combined nursery and primary Welsh medium school in Llanelli, part of Carmarthenshire Council’s Modernising Education Programme, is already recognised as one of the most ground-breaking schools in Wales. Its environmentally friendly features have achieved BREEAM Outstanding – the first Welsh primary school to do so – and is designed to be zero carbon in operation. The judges noted the ‘passionate’ commitment of contractor WRW Construction in implementing a holistic approach to saving energy and reducing carbon emissions – considerably assisted by an informed, cooperative client. Features such as outdoor learning environments encourage eco-friendly behaviour in the children, while measures such as natural ventilation, solar shading, rainwater harvesting, photovoltaic panels and air source heat pumps all contribute to energy efficiency and a comfortable internal environment. But what impressed most was the management of the project and the engagement of stakeholders and the community. Initially sceptical locals were won round through close liaison and good site practices, along with benefits such as 21,000 hours of paid work for locally unemployed people and 11,480 hours of work for apprentices, trainees and new entrants. Regular site visits were arranged for pupils, teachers and governors to ensure their needs were met. Effective communication underpinned collaborative team working and good working relationships within the delivery team. During the design stage WRW set up a cloud-based system called Box to store and share information, which worked so well that one judge felt it was a forerunner of BIM. The judges commented that the management model could be replicated throughout the industry. Set in the Snowdonia National Park, this visitor centre is the first in the UK built from low-grade local timber and manufactured Brettstapel. The pioneering project used off-site fabrication to minimise the environmental impact, improving productivity and shortening timescales while respecting the beautiful surrounding landscape. The Heads of the Valleys region suffers from severe, long-standing deprivation and was Wales’ first strategic regeneration area. It is characterised by economic inactivity, poor quality jobs, unfavourable image and limited transport and telecommunications. 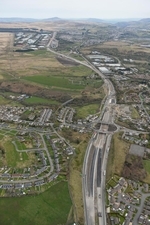 The Welsh Government identified the upgrade of an eight kilometre stretch of the A465 in Blaenau Gwent as a major opportunity to deliver regeneration. The five-year project, delivered by Carillion, is now nearing completion and will increase value for Wales not just by delivering first class modern infrastructure, but by maximising economic benefits for the local and wider Welsh economy. The project has secured £82 million of European Regional Development Funding as a result of the team’s success in demonstrating the positive impact it will have on the local community. Much of this impact was made possible by early contractor involvement (ECI) and the choice of a collaborative NEC target cost contract, leading to plenty of time for planning and consultation with the local community. The judges felt the contractor had gone beyond what was required in adding value, both during construction and in terms of the legacy for Blaenau Gwent. Social, economic and environmental objectives were set high. For example, 3,500 young people have been engaged through 65 activities involving 37 educational prodviders. The project has provided 25,000 weeks of Welsh employment with investment of £75 million in Welsh business; 45 per cent of the spend was in Heads of Valleys. Thanks to on-site material processing and re-use of material, over 99 per cent of site waste was diverted from landfill. The overall boost to the Welsh economy is estimated at £180 million. Through the project, the first Nation Skills Academy for Construction (NSAfC) has been brought to Wales, and the team has shared learning across the industry as demonstrated by the NSAfC and business class clusters. This Shared Apprenticeship scheme came into being as a response to the construction industry’s need for talented young recruits. Launched by South West Wales Regional Shared Apprenticeship and CITB, it motivates and inspires young adults to seek sustainable employment while helping to secure the industry’s future. It actively engages with schools, participates in community events and collaborates with other initiatives to identify a wide pool of potential trainees. The judges were particularly impressed with the scheme’s diligence in targeting under-represented groups, such as females, young people with disabilities and members of the local travelling community, who might go on to break down social barriers and become leaders. Passion, strong cross-sector leadership and a clear strategy have been crucial to success; the scheme works with local authorities, housing associations, regional colleges, independent training groups, contractors and SMEs to develop training programmes and provide placements. Currently more than 140 shared apprentices are fully employed across seven trades. The young people work with a number of different employers on rotation, acquiring exposure to a variety of workplaces and assisting employers who have found it difficult to provide placements due to the uncertainty of the workflow. The approach has been described as the ‘ultimate work-based learning experience’. To date 90 per cent of apprentices have been retained within the industry, with several setting up their own companies or progressing to higher education. Already the model is arousing great interest in other parts of Wales and the UK. ‘It’s a great project that has yet to see its full potential, which is exciting,’ said one judge, adding that it could provide a template for other regions. This ground-breaking school is the first primary school in Wales to achieve BREEAM Outstanding. The judges singled out the ‘passionate’ commitment of contractor WRW Construction in implementing a holistic approach to sustainability, considerably assisted by excellent team working and the enthusiastic involvement of the local community. To win this award the organisation must show that health and safety measures have exceeded what is required within the CDM regulations 2007. The £13.5 million project to build Cardiff University’s new Business School, overseen by ISG, sought from the start to achieve outstanding levels of health and safety among the workforce and the general public. Implementing the successful health and safety strategy was underpinned by the integrated and collaborative team working established on the site. At the outset of the project a workshop was held to identify areas of improvement and best practice. From this, a project charter was created and champions for particular areas of focus appointed – including health and safety. This ensured that site-specific challenges were immediately identified and addressed. For example, the city centre campus site, located close to a railway line, was often crowded. The safety of pedestrians in and around the live university environment was addressed through such measures as a gateman, secure site access arrangements and the introduction of safe pedestrian routes outside the site with barriers and lighting. An innovative health and safety app was developed and distributed to the supply chain to help manage travel safely, including deliveries to the site. Health and safety information and updates for students and staff were displayed on a screen in the business school’s existing building. Noise was monitored at stations on the site boundaries and dust was suppressed through wet cutting of materials and dust extraction units fitted to tools. Site staff worked with local cancer charity Tenovus to provide on-site health screening sessions for the workforce and the local community. It’s no surprise that the site received a merit award from the International Safety Council. Active steps were taken to share lessons and best practice, and already the health and safety app has been used on other schemes. 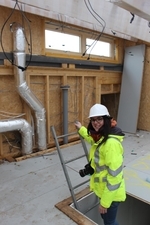 Ester, a research assistant at Cardiff University’s Welsh School of Architecture, has developed an impressive set of skills that were on full display during the design and construction of the Solcer demonstration house. This is an affordable, very low energy building where low carbon technologies are integrated into the building structure rather than ‘bolted on’ in the usual way. The aim is to show that integrating renewable energies into a building does not necessarily compromise on cost or performance. Ester’s boundless enthusiasm for the project, coupled with her technical knowledge and ability to inspire and motivate others, are what caught the judges’ eye. At just 28, her cross-disciplinary skills are impressive; she was equally at home developing computer models to calculate thermal performance as designing specialised wall cladding and managing people on a day-to-day basis. She is unfazed by obstacles, showing a clear willingness to think outside the box when faced with problems, and the judges loved her ‘can do’ attitude. She is able to cope with challenging on-site behaviour in a professional and sensible manner and a talented diplomat when necessary to ensure smooth working relationships. The judges were impressed by her detailed knowledge of the project and awareness of what the findings could mean for sustainability and the wider construction industry. Her commitment to environmental performance is unquestioned; she has, for example, developed a computer-based model to explore the design and technology aspects needed to meet the UK government’s tough greenhouse gas emission targets. But above all, the judges felt that Ester has what it takes to drive change in what can be a conservative sector. Her enthusiasm is contagious, and she has the charisma to carry others with her into the future. Martin Nicholls, Chief Operating Officer for City & County of Swansea, has been in the forefront of the Welsh best practice movement for many years as a leading figure in the South West Wales Best Practice Club and within Swansea’s Corporate Building & Property Services team. His successful impact with his team dates back to 2007 and stands out as an exemplar of good practice in the public sector. Its success in opening up training and development opportunities for staff and engaging young people was underlined in 2011 when the Council won the Constructing Excellence Leadership & People Development Awards at both an all-Wales and UK level. Martin and his team realised that action was needed to ensure a sustainable supply of skilled staff to deliver its services. The team worked closely with schools and the careers service to help schoolchildren gain an understanding of the department’s role and the career opportunities on offer. The work-related education programme, for example, allowed students to attend the organisation for one day a week over 30 weeks to engage in ‘real-life’ work-related tasks. This is typical of Martin’s commitment and belief in what construction can do – not just in terms of built fabric, but in terms of the communities the industry serves and impacts upon. Anyone working with Martin will have seen his enthusiasm for encouraging a partnership approach and an emphasis on integrated delivery teams – always with a focus on the holistic place construction has in Wales. This is why he has a reputation in south west Wales as someone who can access and influence key decision makers.